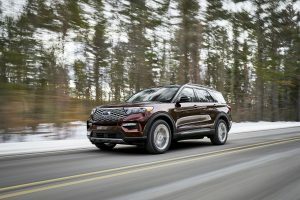 Last night, in front of over 5,000 Ford employees, press and suppliers, including a handful of LaFontaine Automotive Group employees, Ford unveiled the completely redesigned 2020 Ford Explorer – America’s best-selling SUV in history. Ford engineers described it as lighter, leaner and stronger — but, most importantly, designed with the consumer at the center. With more than 7.8 million sold, more Explorers have been purchased since the original model debuted as a 1991 model than any other SUV. The 2020 model will have a base price of $33,860, Ford said Wednesday evening. The new rear-wheel drive layout (with an all-wheel-drive option) enables a sporty design, improved on- and off-road capability, and 600 pounds more towing capacity. 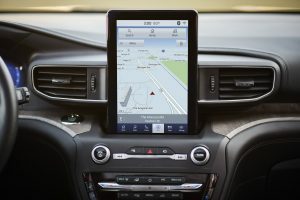 The SUV has a 10.1-inch touch screen; drive assist technology that includes reverse brake assist, and active park assist that handles all steering, shifting, brake and accelerator controls with the touch of a button. He noted that the vehicle also offers a “really cool” new feature: side wind mitigation. Standard features include automatic emergency braking, pedestrian detection, blind-spot alert, power tailgate, LED head and taillights, post-crash braking to keep the vehicle from ricocheting into secondary impacts, and steering that subtly compensates to keep the vehicle going straight in crosswinds. 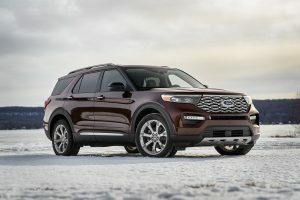 Ford will use those features and capabilities to showcase the Explorer as a gateway to family adventures.